Researchers at Cornell University are using workshops and webinars to advocate sanitation techniques in maple sap production. The researchers found that by replacing spouts and drop lines, you can reduce the microbial contamination that occurs at the tap hole, which has resulted in substantial production gains. Simply changing taps and tubing or using special spouts could double the amount of sap seeping from New York’s maple trees, according to Cornell experts who have spent six years researching the topic. “Taking steps to reduce the microbial contamination that occurs at the tap hole by replacing spouts and drop lines has produced substantial gains in sap production in trials at Cornell’s Arnot Research Forest and in producers’ sugarbushes,” said Stephen Childs, Cornell Maple Program director. 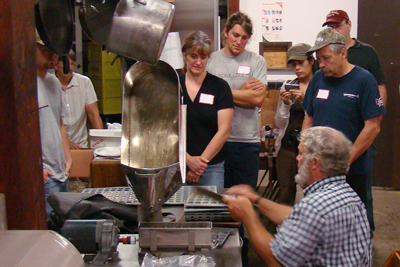 Through workshops and webinars, Childs and his colleagues are advocating sanitation techniques among New York’s maple producers. The results have been increased sap yields and expanded production for many, according to Mike Farrell, director of Cornell’s Uihlein Maple Forest in Lake Placid. The average volume of sap per tree varies from 10 to 20 gallons per tap, and it takes about 40 gallons of maple sap to produce one gallon of pure maple syrup. New York State Maple Producers Association President Dwayne Hill credits the Cornell Maple Program for helping to boost New York’s $12.3 million maple industry. “The research Steve Childs has done has had a huge impact on being able to tap two to three weeks earlier in the season without worrying about bacteria contaminating the tap hole,” Hill says. “The moderate, early, temperatures and limited snowfall this winter will allow most producers to more easily work in their sugarbushes, and I suspect we will eventually get the winter weather necessary to sweeten the sap and cause the flow,” adds Peter Smallidge, director of the Arnot Teaching and Research Forest in Van Etten, N.Y.
Be the first to comment on "Researchers Use Sanitation Techniques to Boost Sap Production"